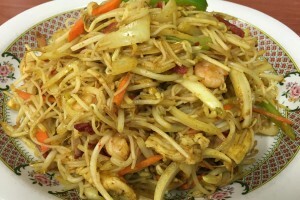 Rice noodles, shrimp, BBQ pork, and chicken white meat tossed together with curry powder. Boneless chicken breast bits, lightly battered and deep fried to a golden crisp, finished off with our homemade lemon sauce. Fried sliced chicken, shrimp, and barbequed pork with mixed Chinese vegetables. 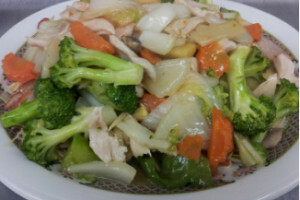 A combination of chicken, shrimp, barbequed pork and mixed vegetables served on a bed of noodles. 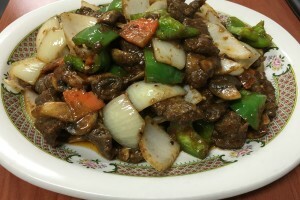 Strips of tender beef, mushrooms, onions and green peppers, smothered in an exotic Chinese sauce. 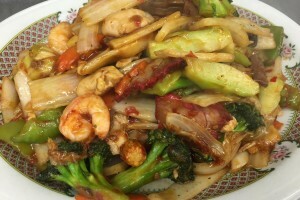 Shrimp, chicken and beef sautéed with Chinese vegetables in hot spicy sauce. Combination of chicken, beef, barbequed pork and shrimp sautéed with top quality Chinese vegetables cooked individually in our family styled hot pot.